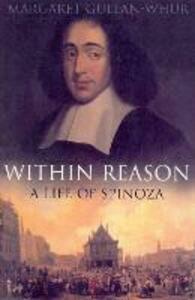 The seventeenth-century philosopher Spinoza was expelled from the Jewish community of Amsterdam the age of twenty-four for 'horrendous heresies', and was eventually reviled by all religious authorities for claiming that human beings are parts of a single, unified nature, that God is identical with nature, and that reason, not revelation, supplies the truth of any aspect of God. Undeterred, he made this thesis the basis for a rational crusade against superstition and prejudice. Dr Gullan-Whur's biography, the first for twenty-eight years, shows how Spinoza's central philosophical beliefs developed within the context of his own life. Drawing on very recent scholary research and making detailed reference to primary sources, some not previously explored, the author focuses on the philosopher's attempt to act solely through reason in the face of turbulent personal and national circumstances. This new approach demolishes the myth that Spinoza was a lofty ascetic. It exposes his emotional and sexual vulnerabilit arrogance and misogyny, yet shows his living philosophical experiment to be shrply relevant today.